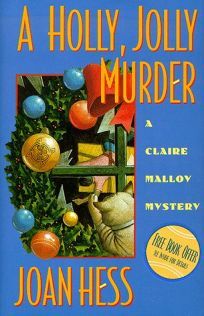 In her 12th appearance (after Closely Akin to Murder, 1996), Farberville, Ark., bookstore owner Claire Malloy finds that her desire to be helpful (propelled by an insatiable nosiness) gets her deeply involved in a puzzling midwinter murder. Wealthy physician and landlord Nicholas Chunder has been shot, and evidence points to several of his tenants who are members of his very own cult, The Druids of the Sacred Grove of Keltria. Was Chunder murdered because he was planning to evict one of the cult members? Did a 16-year-old Satanist carry his rituals too far? Claire, beseeched for aid by the cultists who visit her bookstore, uses a low-key approach to interview some decidedly unconventional Wiccans, Satanists and Druids, each of whom adds an individual spin to what becomes an increasingly muddled case. Claire keeps her calm outlook, even as her daughter Caron, a lively and extremely likable teenager, gets into some monumental trouble while working as a Santa's helper at the local mall. Since Claire's significant other, the town's police lieutenant, is out of town (consorting with his former wife), she deals directly with Farberville's gullible yet benign police force. Despite a few unnecessary plot twists and a somewhat contrived finale, Hess's latest is delightful entertainment, a just-right antidote to holiday busy-ness or anytime blahs. (Nov.) FYI: Hess, who also writes the Maggody mysteries, is currently president of the American Crime Writers League.